141. A Rant: How Can Color Go Out-of-Style? Editor’s Note: The writer has never in her adult life claimed to be in style or cared about being in style. Yet, like everyone who has eyes and ears, the writer is affected by what she sees, so in that case, we are all affected by what is in style, whether we want to be (or care) or not. This post has been swirling around in my head and on my computer for months. It’s been edited and re-edited. Mostly it just irritates me that there are Colors of the Year. Indeed, how can a color go in and out of style? Jewel tones? lush emerald, dark ruby red, and midnight blue. Beautiful always, yes? Nature tones? pine green, autumn rust, walnut brown? Beautiful always, yes? Brights? sunny yellow, lime green, sky blue? Beautiful always, yes? Designers and style companies tell us that the number one way to sell your house faster is to get rid of those “out-of-style” paint colors and “do fresh.” Shabbiness and fading aside, I’d just like to point out that the colors we’re being told to paint over now, are the colors we were told to paint then. Earlier this year (when we still had a house on the real estate market) Zillow sent me an article called Top 5 Home Design Trends of 2015. I don’t know why I read it; curiosity, I guess. But it just irritated me greatly. (Judging from the comments, this was true for many people…) So in case, you care about such things, midnight blue is in, coral and other Bright Colors are out — according to this particular designer. I’m not sure how she could proclaim that coral is out, but she did. Perhaps it is now called Melon? About fifteen years ago my daughter wanted a mint green formal for the senior prom. We went to every JoAnn Fabric store in Western PA (and there are a lot!) until finally some nice clerk at the fabric counter took pity on me. No, she told us. You can’t get that color this year. It just isn’t being made. You can get this pretty celery green, instead? 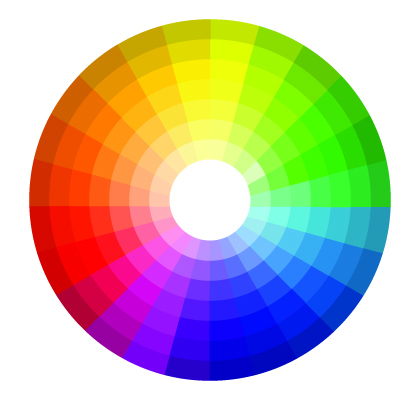 This is just one of the RGB color charts available from My Practical Skills, a design student’s dream site. Can you pick the shades that are in style? Yes, we can’t have everything all the time, but for ten years I looked for deep forest green accessories to go with a rug — pillows, curtains, fabric, bedspread — anything! Yes, there are way more important issues in the world, but isn’t this symptomatic of our Western culture of materialism? Planned obsolescence — if the color is out-of-style then we’re likely to replace it, aren’t we? That deep, dark green that is the color of pine trees? Out? Outre? Not available? Because a bunch of industry leaders in a board room got together and decreed it, so they can sell more stuff in a different “updated” shade of green? In my humble opinion :-) color should not be associated with in style or out-of-style. If you want to call my shirt or my couch or my lamp out of fashion, fine. But leave color out of it. I found the tablecloth below– unopened in its original package — in an antique store last fall. I loved the colors, and they go in my dining room perfectly. I know that the tablecloth is probably out, but I. Don’t. Care. It’s perfect, and I smile every time I put it on the table. Isn’t that what color is about? And the color on my dining room wall? Yep, I still love that deep forest green of pine trees. Only now it’s back in. Just don’t call it Forest Green.